Let us begin National Volunteer Week celebrations with two words − Thank you. 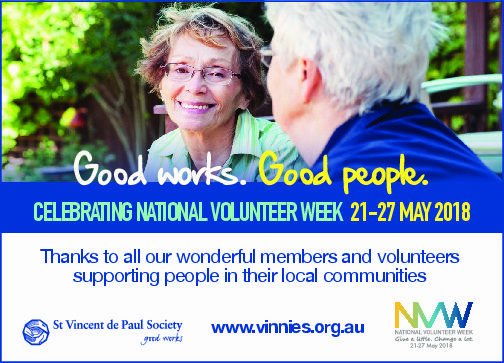 Thank you to the many St Vincent de PaulSocietyvolunteers and members in NSW who contribute tireless enthusiasm, boundless energy and countless hours to improve the communities we live in. Thank you to the volunteers, coordinators and Conferences who work so hard to bring in the resources that keep community service organisations like Vinnies fulfilling their mission. Thank you to the companies that recognise that encouraging employee volunteering brings community and organisational benefits. And finally, thank you to our advocates out there who tell the stories of those without a voice, encourage a culture of giving, and build our volunteer capacity. * Over 15,000 volunteers have contributed countless hours to volunteering in areas such as our retail stores, Special Works Programs in service areas such as homelessness, disability, drug and alcohol, mental health, refugee and migrants, food services, and learning and community development. Volunteers have also been involved in raising funds at key events such as the CEO SleepOuts. * Our Members have helped over 60,000 people. This has consisted of over 160,000 visits, contributing over 60,000 hours and also raising millions of dollars of funds. We know volunteers don’t do what they do for acknowledgment but that doesn’t mean we shouldn’t remember to show our appreciation. So, let us close this letter the same way we started…THANK YOU!